As part of Infinite Global’s campaign, ‘Placemaking: Buzzword or Brand Builder?’, Tal Donahue interviewed Nada Rafih Hosking, Director of Projects, Programs and Partnerships at Global Heritage Fund. TD: Thank you for talking to us Nada. 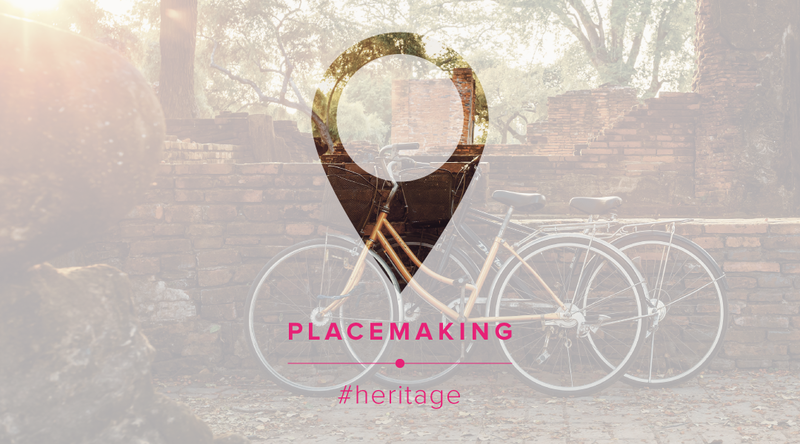 During the research for our campaign, ‘Placemaking: Buzzword or Brand Builder?’ one of the issues that kept on cropping up was the important role that heritage, culture and identity play in the creation of places that connect with communities. As a professional working at the intersection of heritage conservation and community regeneration, we thought you would have some fascinating perspectives. First of all though, who are Global Heritage Fund? NH: Global Heritage Fund is a US-based NGO with subsidiaries in London and Hong Kong. Our work focuses on the sustainable preservation of significant cultural heritage buildings and sites in developing regions around the world. To date, we have worked on 28 sites, in 19 countries, and with over 100 partners. We approach our work through a scalable and replicable methodology we call Preservation by Design®, which encompasses planning, documentation, conservation, and community development. Through our approach, we strive to empower people on the ground to conserve historic assets that offer significant cultural value, and provide sustainable paths to economic development. TD: What does Placemaking mean to you? How far does your understanding compare or contrast with that of the real estate industry, or other stakeholders you regularly engage with? NH: Heritage preservation is at the heart of Placemaking. Historic preservation veteran and GHF Senior Advisor, Donovan Rypkema, describes place as “the vessel within which the ‘spirit’ of the community is stored.” In essence, community is the catalyst for making a place, which would otherwise be a mere location. Through our projects, we not only restore sites and buildings to their former glory, but we work with multiple stakeholders to find long-term uses that strengthen the connection between the people and their spaces, ensuring the sustainability of our endeavors. We are an organization concerned with historic preservation, and our work has shown us that the fight for heritage preservation and enhancement is fundamentally a communal endeavor. From the beginning of every project, we base our work in the leadership of our multiple stakeholders, ranging from local community boards to NGOs, private sector companies, and local and national governments. In this way, we can address the root social and economic factors that frame human relationships with cultural heritage sites. In real estate development circles, "Placemaking" has long been used to describe a community-oriented approach to designing the built environment. However, “Placemaking” has critical components and growth areas that go beyond the design process. After construction has ended and the crews have gone home, a new location does not become a place until it is infused with social and cultural significance co-created by its users. This may go beyond the designers, planners, or developers’ expectations, underscoring why it is important to consider the community’s input in building and development practices at an early stage. It is essential to the Placemaking process. Consider what it is that makes a community a desirable place to live in. Obviously, key indicators like safety, school quality, and proximity to work opportunities are important material factors conducive to the success of a thriving community. What makes it a community, a place, is the connection people have with it and with each other. Like open spaces, historic places can add value to real estate development and provide a stimulus and focal point for regeneration schemes, which create more homes and more jobs. The more desirable a community becomes, the more likely it is that property values will increase. TD: Why is Placemaking important to Global Heritage Fund’s work? How does it fit in with what you do? NH: What makes historic buildings and sites significant is the deep connection people have with them, and ultimately, this is rooted in their cultural significance. Let’s think about why a location becomes a place, or in our own context, why a place becomes a cherished heritage site. Take, for example, a Gothic cathedral. This structure was intended to create a bridge between the temporality of humanity and the perfection of divinity, a structure that often took centuries and the passing of generations to build. Simply stepping foot inside such a place is electric, a connection with the living, the dead, and those yet to be. It is a simulacrum of eternity. A Gothic cathedral, or a temple built in the Cambodian jungle 1,000 years ago, or the overgrown ruins of a long-dead civilization in Colombia inspire. They uplift the human spirit. These heritage sites represent the collective history and identity of a people, and they belong to everyone therein. In this sense, identifying what makes a heritage site more than a mere attraction, what makes it a “place,” is essential to our work. Determining the essential qualities of a building or a site gives us insight into why it is important and how we can best conserve it. Heritage, after all, is about interpreting history for the future and re-reading our past through our contemporary values. TD: How far do you feel the real estate industry in general understands and appreciates the value of heritage to Placemaking? NH: It’s a mixed bag. At its best, the real estate industry works in concert with the pre-existing built environment of a place, designing buildings that emerge almost organically from the fabric of pre-existing urbanism. At its worst, the real estate industry does great violence to heritage and thus the essential nature of a place. Modern architecture that is based upon new technologies of construction tends to reject historical contexts in order to invent something that is purely functional and new. You can see this very clearly in many modern Chinese cities, where mass urbanisation has led to the widespread demolition of the old and vernacular. The triumph of generic, modern designs results in what one critic called “one look for a thousand cities.” It has changed the character of cities, and not for the better. The real estate industry must be careful when considering how its development plans interact with pre-existing built heritage. It takes centuries to create a harmoniously integrated urbanism, such as that of Beijing or, in the West, of Rome, but only one jarring building to disrupt it. To effectively incorporate the value of heritage for Placemaking, the real estate industry needs to recognise that historic buildings and sites are the product of extended communal efforts involving a multitude of stakeholders. By embracing a community-oriented approach that draws upon local assets, inspiration, and potential, developers – like preservationists – can tap into the wellspring of communal creativity that gives heritage sites their appeal and create places of long-lasting value. TD: What are the challenges with balancing the need to develop (notably including real estate), with the need to protect local identities and heritage? NH: There’s a quote, often attributed to Gustav Mahler, which says that “tradition is not the worship of ashes, but the preservation of fire.” Essentially, the ways past eras have developed their cities is not consigned to the dustbin of history but is an essential part of our daily lives. Development should emerge out of the organic framework that is already there, building upon the past without being a slave to it. This creates a win-win situation where we can conserve what is best in our places without sacrificing any of the perks of modernity. To return to the example of contemporary China, urban development was allowed to run roughshod over the historical fabric of many cities, and in place of a harmonious environment, a mishmash of discordant elements were thrown together. As is often the case, however, the communities fought back, and today, a broader range of actors has realised the importance of heritage conservation in preserving the authenticity of place. Historical neighbourhoods are now seen as desirable places to live precisely because they exemplify traditional forms and the values and aesthetics those forms represent. The people moving there have chosen to maintain the forms of the past in concord with the methods of the present, improving their living conditions without demolishing the built heritage of their ancestors. Place is something created over a very long time, and it is much easier to lose it than to get it back again. Happily, both the state and the market recognize the immense visited on their own heritage, making it much more difficult to green light these short sighted projects in the future. It’s clear that conserving heritage has socio-economic viability, and incorporating conservation as a planning function would alleviate the conflicts of interest that emerge between those seeking to preserve their heritage and those wanting to maximise the real estate potential in urban areas. It is indeed possible, and even desirable, to have both. However, given the rising economic pressures of real estate development, the conservation of built cultural heritage requires directional policies and incentives to achieve a certain balance. This would involve channelling real estate development demands and requirements as well as making conservation more meaningful for communities. TD: What would your message be to the real estate industry, particularly those at MIPIM, regarding heritage preservation and conservation? NH: Know the history of the place and start with the community. This is key to successful Placemaking. Grassroots participation can provide useful insight and perspectives early in the process, saving developers valuable time and resources. If the relevant stakeholders feel a sense of ownership and are treated like partners, they can be invaluable in providing support and getting any development project off the ground.